Huangguoshu Waterfall is one of the largest waterfalls in China and East Asia located on the Baishui River in Anshun, Guizhou province. It is 77.8 m (255 ft) high and 101 m (331 ft) wide. The main waterfall is 67 m (220 ft) high and 83.3 m (273 ft) wide. 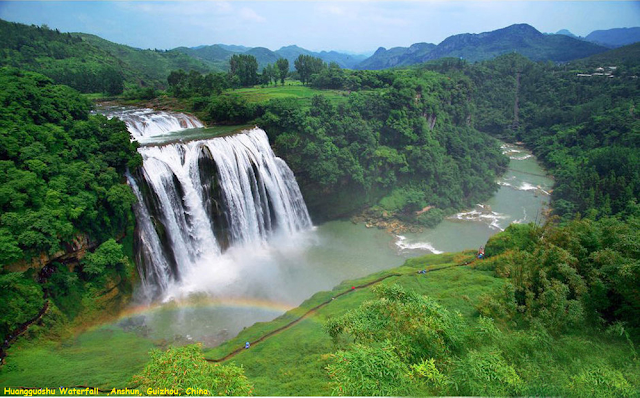 nown as the Huangguoshu Waterfall National Park, it is 45 km (28 mi) southwest of Anshun City. Together with minor waterfalls, the charms of the waterfall is a natural tourist draw.